“Those who do not learn from history are doomed to repeat its mistakes” — it’s a quote that’s actually quite applicable when it comes to writing for SEO. Much of the advice given to copywriters, journalists, editors, and other content creators for SEO writing is dangerously out of date, leaning on practices that were once tried and true but that could now get your site penalized. In this edition of Whiteboard Friday, we hope you enjoy a brief history lesson on what should be avoided, what used to work and no longer does, and a brief 5-step process you should start using today for writing content that’ll get you to the front of the SERPs. Howdy, Moz fans, and welcome to another edition of Whiteboard Friday. This week we’re chatting about writing for SEO and what that means in 2018. So writing for SEO has had a long history, and it meant something many years ago that it does not mean today. Unfortunately, I see a lot of bad advice, terrible advice out there for journalists and editors and authors of all kinds about what you need to do in terms of writing for SEO, meaning writing to get you to the top of search engines. Now, let’s be clear, some of this stuff is mired in pure mythology. But some of it is mired in historical fact that just hasn’t been updated. 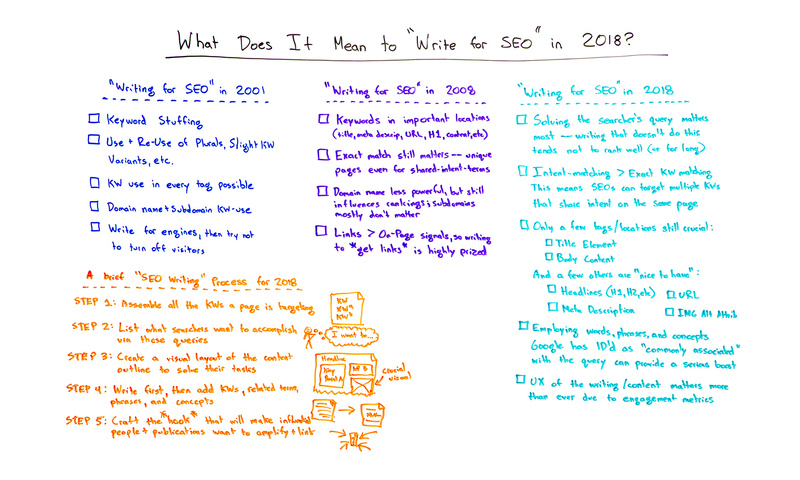 So let’s talk about what writing for SEO used to be back in 2001, how it evolved in sort of the middle era of 2008, let’s say, and then what it means today in 2018. If you wanted to rank highly in early search engines, especially the late ’90s into the early 2000s, keyword stuffing was a real tactic that really did have effectiveness. So SEOs would cram keywords into all sorts of tags and locations. So if I’m targeting the word blue watches, I would have blue watch, blue watches, blue watch accessory, blue watch accessories, blue watches accessory, blue watches accessories, ridiculous little variants on plurals because the search engines were not great at figuring out that all these things sort of had the same intent and meant the same thing. So raw, rough keyword matching, exact keyword matching was part of SEO. If there was a tag, you’d cram keywords into it. So this is why you saw that brands would be outranked by, to use our example, blue-watch-accessories.bluewatchaccessories.info, that kind of silly stuff would be ranking. Some of it even maintained for a while. So, a lot of the time, people would want to cloak. They’d want to show one set of content to the search engines and another set to searchers, to actual users, because they knew that if they showed this dense, keyword-stuffed content to users, they’d be turned off and they wouldn’t find it credible and they’d go somewhere else. 2008, we evolve on a bunch of these fronts, but not all of them and certainly not perfectly. II. Exact matching still matters in a lot of places. So people were crafting unique pages even for keywords that shared the same intent. Blue watches and blue timepieces might have two different pages. Blue watch and blue watches could even have two separate pages and do effectively well in 2008. 2018, that’s not the case anymore. They still had some play in the engines. You still saw a lot of debates back in ’08 about whether to create a keyword-rich domain. In fact, it still is, but we’ll talk about the evolution of that a little bit. So now let’s jump another decade forward. We’re in 2018. This year, what does writing for SEO mean? Well, a bunch of things. II. Intent matching matters a lot more in 2018 than exact keyword matching. So, pragmatically, what does this history and evolution mean? Well, I think we can craft a brief sort of SEO writing process for 2018 from this. This is what I recommend. If you can do nothing else, do these five steps when you are writing for SEO, and you will tend to have more success than most of your competition. So there should be a list of them. They should all share the same intent. You get all those keywords listed out. So someone searched for blue watches. What do they want? Information about them, they want to see different models, they want to know who makes them, they want to buy them, they want to see what the costs are like, they want to see where they can get them online, probably all of those things. Those are the intents behind those queries. Here’s going to be our headline. Here’s our subheadline. We’re going to put this important key concept up at the top in a callout box. We’re going to have this crucial visual next up. This is how we’re going to address all of those searcher intents on the page visually with content, written or otherwise. The ones that will hopefully help boost your SEO, rather than writing first with the keywords and topics in mind. You can have a little bit of that, but this would be what I suggest. Because, in 2018, links still do matter, still are an important part of SEO. If you follow this and learn from this history, I think you’ll do a much better job, generally speaking, of writing for SEO than a lot of the common wisdom out there. All right, everyone. Look forward to your thoughts in the comments. We’ll see you again next week for another edition of Whiteboard Friday. Take care.